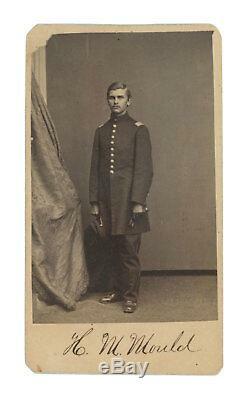 A nice CDV of a young Union infantry officer identified in period ink as H. In the HDS database of Civil War soldiers only one H. Mould is listed as an officer, Lieutenant Henry M.
Mould of the 118th New York Regiment. Mould was 19 when he was commissioned in August 1862. He was discharged in July 1863. In this image, Mould is seen in a full-length pose dressed in nine-button frock with dark blue trousers. He holds his forage cap in one hand and what appears to be a leather glove in the other. The carte measures about 2 1/2 x 4 and is in very good condition. Please see my other items for more Civil War letters, documents, and images. The item "Civil War CDV of Lieutenant Henry M. Mould, 118th New York Regiment" is in sale since Friday, January 25, 2019. This item is in the category "Collectibles\Photographic Images\Vintage & Antique (Pre-1940)\CDVs". The seller is "iron-horse-sales" and is located in Champaign, Illinois. This item can be shipped to United States, Canada, United Kingdom, Denmark, Romania, Slovakia, Bulgaria, Czech republic, Finland, Hungary, Latvia, Lithuania, Malta, Estonia, Australia, Greece, Portugal, Cyprus, Slovenia, Japan, China, Sweden, South Korea, Indonesia, Taiwan, South africa, Thailand, Belgium, France, Hong Kong, Ireland, Netherlands, Poland, Spain, Italy, Germany, Austria, Bahamas, Israel, Mexico, New Zealand, Philippines, Singapore, Switzerland, Norway, Saudi arabia, United arab emirates, Qatar, Kuwait, Bahrain, Croatia, Malaysia, Brazil, Chile, Colombia, Costa rica, Dominican republic, Panama, Trinidad and tobago, Guatemala, El salvador, Honduras, Jamaica, Viet nam, Uruguay.